We have replaced one of our 1977 Piper PA-28-181 Archer II aircraft, N1959H, with a 1977 Cessna 182Q. As a result, we are in the process of selling N1959H. Interested parties can contact the club at info@enginaires.com for details about the plane or to arrange a viewing. We are looking for new partners to join our club. The EnginAires Aero Club is one of the oldest flying clubs in the United states. For decades, we have been a part of the Champaign-area aviation community. 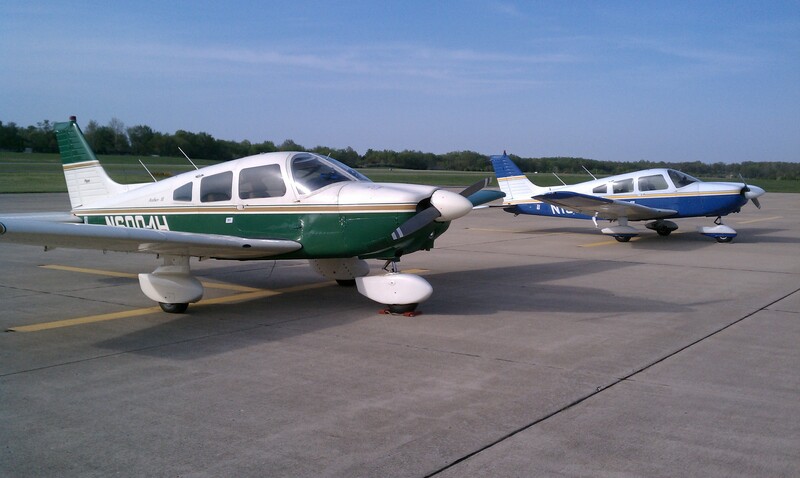 Our self-organized equity based club currently owns and operates a 1977 Piper PA-28-181 Archer II and a 1977 Cessna 182Q that are hangared with Flightstar at University of Illinois Willard Airport (KCMI). Both aircraft are IFR equipped with GPS and autopilot. then EnginAires Aero Club may be the solution for you. Membership is not limited to current pilots! We accept members who are not yet pilots. Club members can learn to fly in club aircraft. If you are interested in more information, feel free to contact the club at info@enginaires.com or attend a montly meeting. Our meetings are held at Flightstar, starting at 7pm on the last Thursday of the month. Additional information about the club is in the About section below. Enginaires Aero Club was founded in 1956 by a group of Engineering professors at the University of Illinois, Urbana. All had an interest in flying, wanted to own and operate aircraft, and to share the costs. The club is a democratically run, equity ownership club. Equity ownership means that all club members are equal owners of the club's assets, including the aircraft and all accounts. It is organized as an S-Corporation. Monthly meetings are typically held the last Thursday of each month in the classroom at Flightstar. The meetings are very interesting for the less seasoned pilots, as there are discussions about maintenance issues and there are always some experienced pilots sharing their views. Organized but brief educational talks are also provided frequently. We have hosted airport CEOs, ATC personnel, Insurance executives, FBO managers and others. Anyone can apply for membership. Most of the current members were pilots before joining, but that is not a requirement. We do accept new pilots and there are currently four flight instructors within the club as well as a number of club-approved instructors that are not members. The exact price of flying fluctuates with costs. There are three principal costs: buy-in, monthly dues, and hourly use. As of February 2019, our buy-in Share Value is $8,500, but prospective members are free to negotiate directly with retiring members. Current club rules provide for the club to repurchase a retiring member's share 12 months after notice for two-thirds value if they are unable to find a buyer themselves. Thus a retiring member will recover some or all of the buy-in costs. Monthly dues cover fixed costs (insurance, hangar rent, annual inspection, age related repairs, etc) and as of February 2019 are set at about $201 per month but vary as membership changes. The hourly rate as of February 2019 is approximately $103 per tachometer hour "wet" (including fuel) for the Archer and $131 for the Cessna 182Q, and fluctuates somewhat depending on current fuel prices. This is much less than renting a comparable aicraft (if you can find a rental aircraft at all). The hourly rate is based on tach hours as opposed to Hobbs which further reduces the actual cost per clock hour. In addition to paying their bills, members are encouraged to attend the monthly meetings, and to help with the occasional plane cleaning sesions or committees. We know that everyone cannot attend all meetings. However, we are defintely owners and not renters. The club safety officer requires an initial checkout before club aircraft are available for use. After that, the club also requires that a flight review be completed annually. Because the club limits membership to a maximum of 12 members per airplane, scheduling conflicts are unusual. Scheduling of aircraft is handled via website (linked in the sidebar on the left). There is no minimum daily hour charge to use the aicraft for a trip. Take the plane anywhere you want within the continental United States and pay only for the actual tach hours you fly. Members may reserve a plane for one long trip per year. A long trip is considered to be one that spans two consecutive weekends. Shorter trips that only reserve a single weekend are unlimited. It is difficult to find that kind of availablity without buying an aircraft on your own. If you are interested in more information, feel free to contact the club at info@enginaires.com or attend a montly meeting. Copyright © 2014-2018 EnginAires Aero Club, Inc.